In the Paranal photo gallery you will see new photos of the recent Mercury transit, a photo of the 4 lasers shooting at the Carina nebula and an image showing the Zodiacal light, which can only be seen in very dark locations. 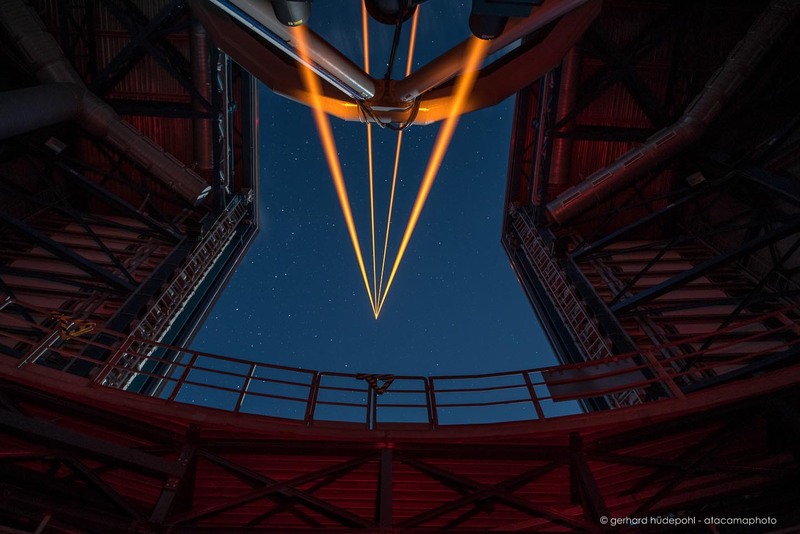 Four new lasers have been installed on one of the 8-meter telescopes of the Very Large Telescope on Cerro Paranal in Chile. They are now tested on sky. The photos in the Paranal section show some impressive views of the new facility. These lasers are now the most powerful lasers used in modern astronomical telescopes. The purpose of the lasers is to produce 4 light spots in the sodium layer of the mesosphere at 90 km altitude. The spots are analyzed and the information is used in real time to correct for the turbulence of the atmosphere. As a result an image quality similar to that of a space telescope can be achieved. See more photos of the lasers in action.